Mary Joycelyn Laban at the Grand Opening of Kidzania Singapore! 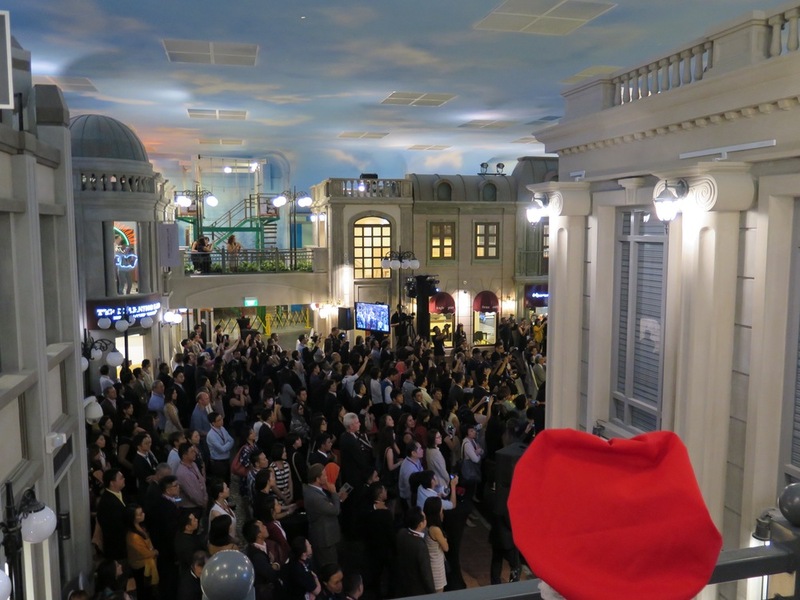 11/4/16 was a special day for The Music Suite's student, Mary Jocelyn Laban, as she was invited to play for the Grand Opening of Kidzania Singapore! For parents who have not heard of Kidzania, ask your children and see what response the name itself garners from them! Joycelyn was tasked to play the violin while standing at the clocktower of Kidzania during the Declaration of Independence, a declaration of kids' independence from adults and an unequivocal announcement of their new world's existence. To add to the difficulty of performing in front of a huge audience, Joycelyn was to play completely unaccompanied! Break time for our little star! Overall, the performance went extremely smoothly and the audience cheered Joycelyn on as she performed a famous tune by Baroque composer Joseph Haydn. This was definitely an experience to remember for our young performer, Joycelyn, and a memory that she, her parents and The Music Suite will keep close to our hearts for a long time! Congratulations Joycelyn, we are extremely proud of you! How many children actually experience using a wireless clip on mic till much later on in their performing career? Joycelyn and her new friend, Ethan, who read the Declaration of Independence to the audience! Joycelyn getting ready to perform! The view from the clocktower from which Joycelyn performed at! A 200-strong crowd at the event! Bryan, one of our youngest performers of the afternoon, looking good in his white blazer! 6/3/16 was an eventful day for the students of The Music Suite. It marked the date of our 5th annual concert since our inception in 2010! This year, we split the concert into 3 segments due to the total number of performers involved. We were very glad to see both our Young Performer and Intermediate ensembles perform too! Audrey, Hazel, Megan and Ryan doing an amazing job. Bravo Young Performer ensemble! The concert went well and we are glad to say that every single performer enjoyed themselves on stage! It was a very proud moment for our teachers to see their own students perform on stage after putting in all the hard work throughout the year. The Music Suite would like to congratulate each and every performer for putting on such a good show and every parent for their valuable time to make this concert a success! Yun Hui and teacher Jeremiah, our emcees for the afternoon. and Yun Hui on the piano and her piano pedal extender after her wonderful emceeing! Always a joy to listen to Alyssa on the Piano! Hazel's wonderful performance on the violin! Joycelyn looking good in white! Performers of the first segment of the concert! Performers of the second segment of the concert! Performers of the third segment of the concert! and the coolest picture of the afternoon goes to.. Ariel! The Music Suite Balloons. Who can say no to balloons? January 16 marked an important day for The Music Suite with the Grand Opening of our new school at Parkway Centre, #06-09! Much effort had gone into making this new school reflect our vibrancy and enthusiasm, allowing us to provide a welcoming and conducive learning environment for our students to excel in. We are grateful to Giovanni L. for providing the wonderful ice cream and Absolute Juices for the refreshing cold-pressed juices at the opening event. The children especially enjoyed the glitter tattoos, for which we are grateful to Amanda FacePaint for making their day! The multi-talented Yong Jie, a familiar face at The Music Suite, applying glitter tattoos for the kids! We learnt much from the 5 years of experience at Mountbatten Square. We have taken all your feedback seriously and worked on continually improving these areas while making sure to retain what parents and students have come to love about The Music Suite. 2016 is a brand new start for The Music Suite. The team at The Music Suite would like to sincerely thank parents and students for the continuous support at Mountbatten Square and look forward to serving you at our new location! Guests of Tong Mingxi Gallery and students of The Music Suite were treated to a brand new selection of violins at Tong Mingxi Gallery yesterday. The event was part of a new initiative by Tong Mingxi Gallery to promote awareness of Violins and Violin Appreciation on the whole. Attendees were in for a surprise as Tong Mingxi himself showcased an Amati violin, which violinist of the night Alan Choo played on. Violinist Alan Choo was described by The Straits Times Singapore as a musician with “an intoxicating brew of poetry and dare-devilry”. He was the 1st prize winner of the National Piano and Violin Competition 2011, Artist Category, making him the first Singaporean violinist to win this accolade since 2001. The Music Suite is proud to announce that Alan will be holding a masterclass at The Music Suite mid August. Stay tuned to http://www.themusicsuite.com.sg or https://www.facebook.com/themusicsuite for more information! 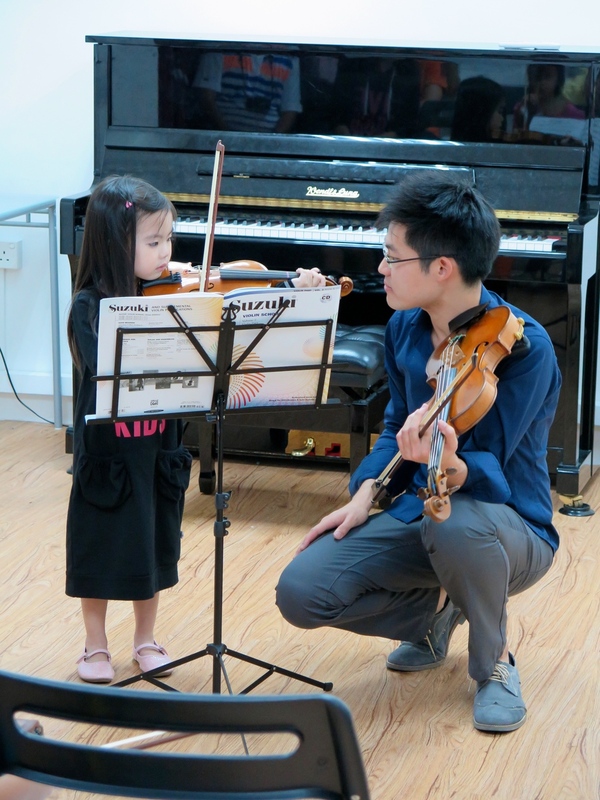 For information on events such as these or anything to do with violin appreciation, fine instruments and instrument servicing, check out http://www.tongmingxi.com! The Music Suite held a 3 Day Violin Boot Camp on the 24/6, 25/6 and the 27/6. The aim of the camp was to give students an idea of how well-prepared they were for the upcoming ABRSM examinations. It was also a chance for the students to brush up on their Aural Training as well as Scales and Sight Reading. Day 1 saw the students go through scales and their pieces without accompaniment. There was a scales test where students would stand in front of the class and have other students pick scales at random. This was nerve-wracking for some(especially our grade 1 students) as it was a wake up call as to what might happen in an examination setting. Once they got the hang of it, everything went smoothly. Day 2 saw the students start their day with a scales test. There was still a degree of reluctance in some students but overall, the students were much more comfortable playing scales at random in front of the class. We also touched on Aural and Accompaniment, where the students went through all the components of their Aural tests to familiarise themselves with the content of the tests. Day 3 started with the same scale test routine. This time, the students were all used to playing scales in front of a class and breezed through the scales with confidence! We then moved on to Aural Training and went more into detail with the piano accompaniment. Overall, the 3 Day camp was a success and students went home more confident and better equipped for their upcoming ABRSM examinations. We wish the students taking their ABRSM examinations all the best! Students 'enjoying' sight reading class! Our students, exhausted from 3 hours of intense violin playing and their messy bags in the background! Teacher Sandy finishes Runner-up at Lucien Wang Piano Competition! Teacher Sandy picking up her prize! We would like to congratulate teacher Sandy on taking home 2nd prize at the 6th Lucien Wang Piano Competition! We are so proud of her and happy to have her as part of our teaching team at the The Music Suite and wish her all the best in upcoming Piano competitions! Just FYI, our teacher Weiyang actually took home 1st prize at the 2nd Lucien Wang Piano Competition a few years back!